Laura Thweatt of Durango (second from left) ran strong with the lead pack of women along Fourth Avenue of Sunset Park on Nov. 1 at the New York City Marathon. She was the first American woman to the finish line and claimed seventh overall with a stunning time of 2:28:23. Thweatt won the USA Cross Country Championships in Boulder in February. 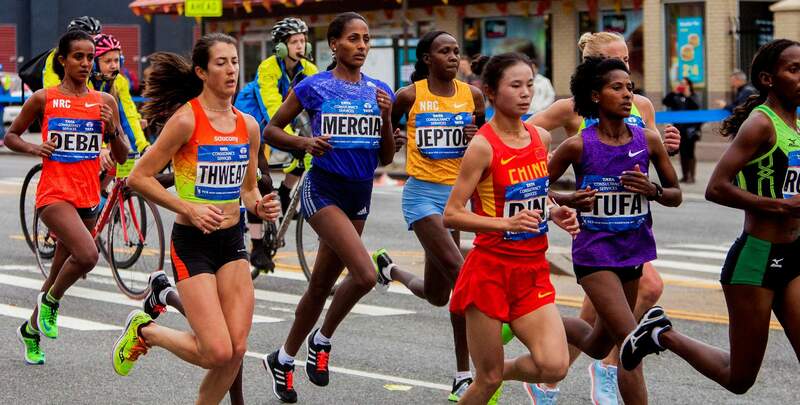 After injury forced her out of spring track, Thweatt and her coach decided to target the New York City Marathon. It was her first attempt at the distance. A Durango-bred runner is on her way to making a mark in the elite ranks of U.S. running. After placing seventh overall and first among women from the United States, 2007 Durango High School graduate Laura Thweatt was the country’s star of the New York City Marathon on Sunday. Her time of 2 hours, 28 minutes, 23 seconds in her first-ever marathon was one of the strongest debuts in a 26.2-mile race by a U.S. woman. Thweatt, 26, ran at a 5 minute, 40 second mile pace even after grinding through the final 6.2 miles and especially the final three. While the average time of the 50,000 runners competing across all five boroughs was 4:34:45, Thweatt was at the front of the pack all day, even leading the women’s field for a short time. She said it took every bit of energy to get her hips and legs through the finish line. It was the culmination of a trying year for Thweatt, who didn’t plan on running a marathon any time soon. 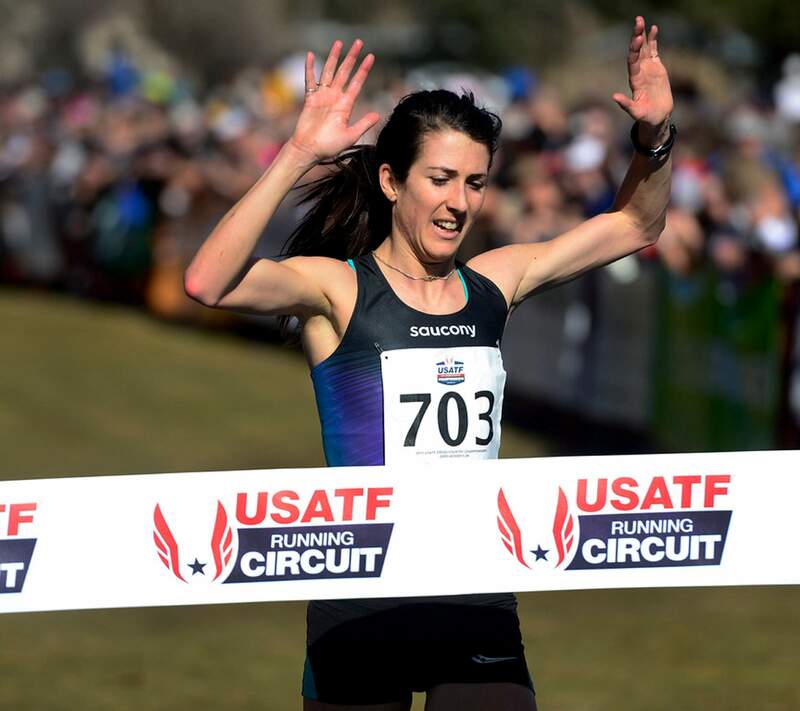 After her best year as a professional in 2014 and a commanding 31-second victory at the 8-kilometer 2015 USA Cross Country Championships in February in Boulder, Thweatt suffered a foot and knee injury that forced her away from the spring track season after a 29th-place finish at the World Cross Country Championships in China. In an effort to rejuvenate her, Boulder-based coach Lee Troop encouraged Thweatt to train for the New York City Marathon to change her routine. It paid off in the biggest way. Though a blossoming marathoner, Thweatt will transition back to running on the track in hopes of qualifying for the 2016 Summer Olympic Games in Rio de Janeiro in the 5,000- and 10,000-meter runs. Women marathoners typically don’t peak until their late 20s or early 30s, giving her plenty of time to make more headlines at 26.2 miles. In the days leading up to New York City and the days after, Thweatt received mass media attention from outlets including ESPN. She said it has been crazy settling back into normal life, but she enjoyed her first taste of being considered an elite runner. Her parents, Jean and Steve Thweatt, who still live in Durango, were also caught up in the whirlwind surrounding their daughter. Both are retired educators. Jean was a principal at Riverview Elementary, and Steve was a counselor and spent time at elementary and middle schools. Thweatt’s meteoric rise has been surprising to everyone. She never placed higher than third at a conference race while competing for the University of Colorado, but she was a two-time regional cross country champion at DHS. Her best career finish at state was runner-up her senior year. Thweatt and her parents never imagined she would compete beyond college when she graduated in 2011, but she credited former CU-Boulder teammate Matt Tebo for getting her connected with coach Troop, a three-time Olympic marathoner for his native country of Australia. Troop has taken her ability to that next level. But Thweatt hasn’t forgotten the coaches and community that helped her mature as a young runner, including former DHS cross country and track coach Mark Dutro, who now leads the Fort Lewis College running programs, and longtime family friend Steve Thyfault. Thweatt visits Durango a few times a year. She grew up in Edgemont Ranch northeast of town and learned to run the surrounding trails with her father. She said her favorite local run is still on the Colorado Trail to Gudy’s Rest. She said the best part about her performance in New York was hearing from so many people from Durango, including her kindergarten teacher.